I have come to really love products from Super Duper. They have so many fun and educational games. 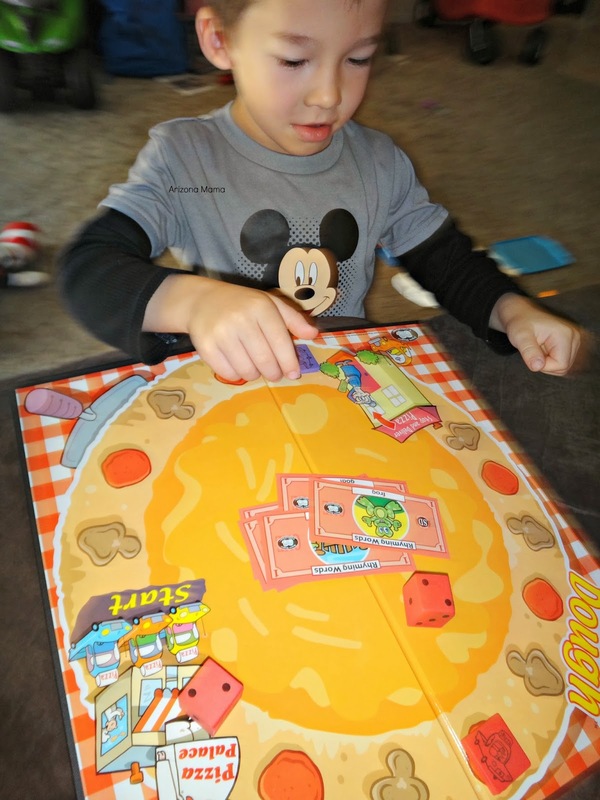 Jayden loves to play games and anything to help him educationally is great. Super Duper was extremely generous and sent us a bunch of products for the holiday gift guide this year. I am excited to tell you about some of the things we received. First up we received the Go for the Dough Board Game. This is a simple, fun game that targets 6 different learning objectives. The game includes a game board, Foam dice, 6 foam car game pieces, 480 Dough Dollars, and a booklet with some suggested answers. First you decide what your objective is for the game and choose those dough dollars. You can choose from synonyms, categories, rhyming words, multiple meaning, opposites, and definitions. We started out with rhyming words when we played. During their turn a player will pick a dough dollar and find an answer. In our game we used rhyming words so if the dough dollar said car then we would need to name a rhyming word. Once we identified a rhyming word we would roll the dice and move that number of spaces (between 1-3). Then we place out dough dollar int he middle of the board. The first player that lands on grandma's house gets to pick up all the dough dollars in the middle. You continue to play as the players go back to the pizza place and back to grandmas house to deliver. After all the dough dollars are gone each player counts how much money they made and the one with the most wins. This was a really fun game. Jayden loved it and I was happy to see him working on his rhyming words. I was surprised how much he already knew. Next we were sent the MagneTalk Meal Time and MagneTalk Telling Time. Both of these items are based around a magnet board and pieces. 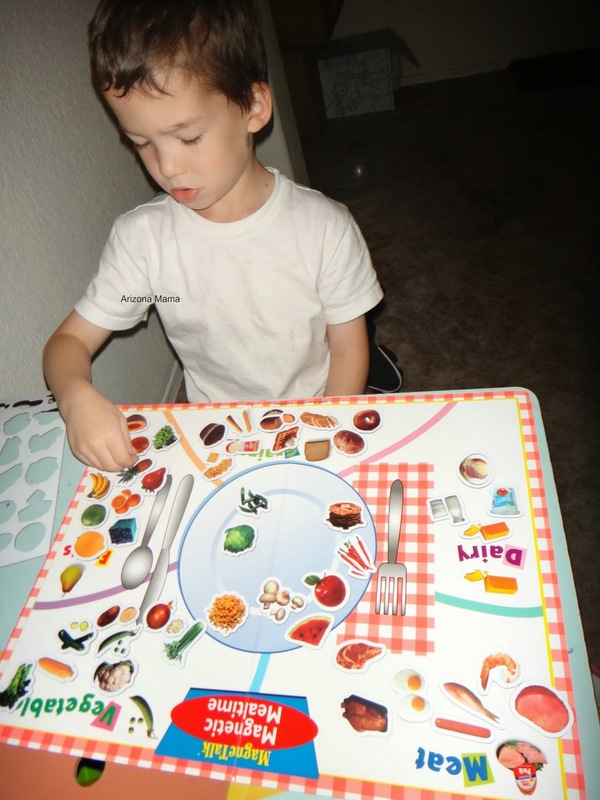 The Meal Time Set includes 48 different food magnets tiles that can be sorted into food groups. You can then put together a meal with items from each food group. Jayden had fun sorting the foods, but had the most fun deciding what to put on the plate for me to eat. The Telling time set includes number tiles and "sentence maker" tiles. In the Telling Time set your child will learn to tell time using the traditional clock and a digital clock. So you set one of the clocks and have him or her represent the same time on the other clock. Children can also make a sentence about the time. Say the clock is set for a meal time then the child can put a sentence at the bottom that says, " I eat at ___ O'clock in the morning." There are so many ways to use this board and teach about time. There are 24 number tiles and 47 make a sentence tiles. Next we received the Classifying Photo Fish Magnetic Game and Story Prediction Fun Deck. The Classifying Photo Fish game is sure to be Jayden's favorite. The set includes 2 11" lightweight fishing rods equipted with a magnet for catching fish. There are 5 different categories and the players work to catch fish in each of the categories. There is a 36" X 23" plastic pond for the fist to "swim" in as you are catching them. It is so fun to go "fishing" while learning. Children can catch the fish and identify what is on the fish and which category it belongs too. This game can go on forever with Jayden. He loves to pretend to fish. The game also comes in a fun plastic tackle box. The Story Prediction Fun Deck includes 56 cards to help your child with predicting what will happen next in a story. Children can read or listen to the short story being read. They then pick from the list of choices what they think will happen next. They use the decoder light to highlight which answer is correct. The set all comes in a nice tin for storage and travel. This would be a good game for a road trip to keep kids busy. The last item we received is a great stocking stuffer idea. It is called an electronic spinner. This is a great stocking stuffer for anyone that loves games. Jayden loves to play games and we have so many of them. Many games require a spinner to decide how many spaces to move. The spinners are easily broken since they are made from cardboard. With the electronic spinner you can replace those broken spinners and have one that makes sounds and lights up. You can turn the sound off if you wish. This is going to be great for replacing some of our game spinners. So it almost goes without saying that Super Duper has lots of great educational and fun games for your little one. There are many games for children with a speech delay, but all the games are fun and educational for everyone. Make sure you check in with Super Duper tomorrow for Cyber Monday. I expect they will have some great deals. Plus remember they always have free shipping on all orders over $20!! I also have a 15% off code to use on anything on their site and it is good until December 20!! Use the code: DHVRBWSV at check out. Thank you to Super Duper for sponsoring this post. The Go for the Dough Board Game looks like something my son would have fun with. I love Super Duper games and products. I also enjoy their newsletter and their website! My niece would like the spinner in place of a dice. Great idea.